If you've read any of my earlier blog posts, you may know that there aren't too many things that scare me more than not being able to breathe (especially underwater)... okay, maybe pigeons (jk), which is why getting scuba certified was a huge challenge for me to overcome. To take it a step further, I now agreed to go diving in an underwater, enclosed net with not one, but two Whale Sharks! Whale Sharks are the largest fish (and shark) in the world, and although I've been told they only eat plankton and have seen them interact with divers at the Churaumi Aquarium here on the island, I almost didn't go on this dive. Matt and Don had wanted to go from the beginning. It took me a little convincing, but I ultimately decided to go for it, and I'm really glad I did! Apparently, there is one other known place in the world that you can swim with Whale Sharks beside Okinawa, and that is in Australia. We've been told by a reliable source (another guy we dove with was actually from Australia) that it costs thousands of dollars, and they are not in an enclosed area, so you are lucky if you even get to see one passing by. I'm sorry, but if I'm going to do this, I would like to spend the whole time with the Whale Sharks, and I don't want to have to chase them around in the open ocean! Needless to say, the experience that Okinawa offers you is really unlike any other! The tour is given by a few local Japanese dive masters out of Torii Station, so after paying, we met the Australian guy who would be joining our tiny group of Americans, got a briefing on the rules, and then watched a video about what to expect out there. The two sharks we would dive with were both males - one 18 feet, the other 22 feet long. The netted area we would swim in was completely enclosed on all sides, top and bottom. "The East China Sea off of Yomitan Village's coast is the only place in the world where you are sure to meet with the elusive whale shark. The whale shark net cage is owned and operated by the Yomitan Fishermen's Association. 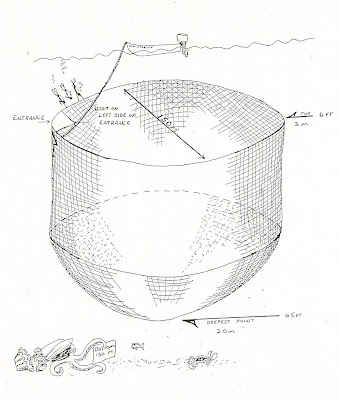 The net cage is located 1/2 mile offshore in 130 feet of water." After getting our gear down to the dive boat, we started to realize that it would be more than just a few extra people with us. Beside us four, the rest of the tiny dive boat was PACKED with Japanese divers and snorkelers.... think sardines in a can - we could barely move let alone get our gear on! After entering the water, we stuck close to our Japanese dive master who actually spoke English. He led us down to the top of the net enclosure where there was a hole just large enough for one person to enter at a time. enterance into the net was at about 15 feet below the surface, and the bottom was about 70 feet down. Once we entered, we each held onto the net "wall" while the dive masters fed the Whale Sharks large amounts of krill. Once they signaled that it was okay for us to enter, we all swam free for the next 30 minutes. You aren't supposed to touch the sharks, but they have a tendency to swim right at you with their giant mouths open looking for some plankton, in which case, you are free to push them away! We intentionally didn't wear gloves on this dive, because we wanted to feel their skin. I got to a few times when they passed me by and hit me with their large tails! After all was said and done, I am SO glad that I did this! I'm also grateful that Don was able to experience this with us as well! I wasn't at all scared of the sharks once I got into the net like I thought I'd be - they really are like giant puppy dogs! This was an incredible experience of a lifetime - something that very, very few people in this world will ever get to experience, and one that I will never forget! More adventures to come from Don & Leanne's visit!